Add some contrast to the office. 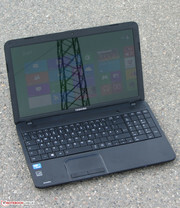 A Celeron dual-core processor from the Ivy Bridge generation powers this Toshiba notebook. The processor joins forces with a 15.6-inch display, plenty of hard drive space and Windows 8. On paper, the computer claims to serve the needs of most users. Whether this is true in practice is a question for our review to answer. If you are on a hunt for a new notebook but do not want to pay a lot of money, it will not take long for you to find a treasure trove of options. In today's market, the buyer is spoilt for choice -- practically every manufacturer offers numerous devices in the 300 to 400 Euro (~$392 to $523) price range. 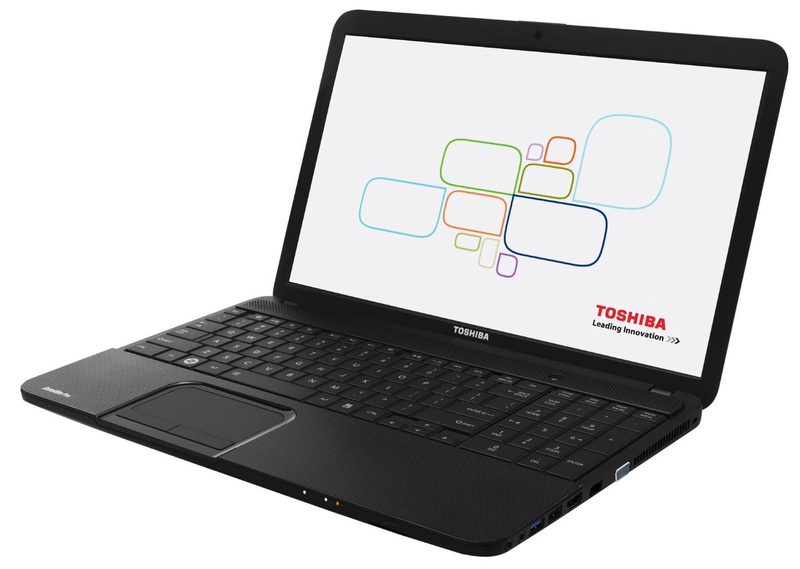 Toshiba adds to the rich assortment with various models from their Satellite C850 series. Our review of the Satellite C850-1LX reveals whether or not the notebooks are much good. To position the notebook in its rightful place in the lineup, we'll measure it against the competing Samsung Series 3 355E5C-S02DE (AMD E2-1800, Radeon HD 7470M) and Asus F55A (Pentium B980, HD Graphics (Sandy Bridge)). 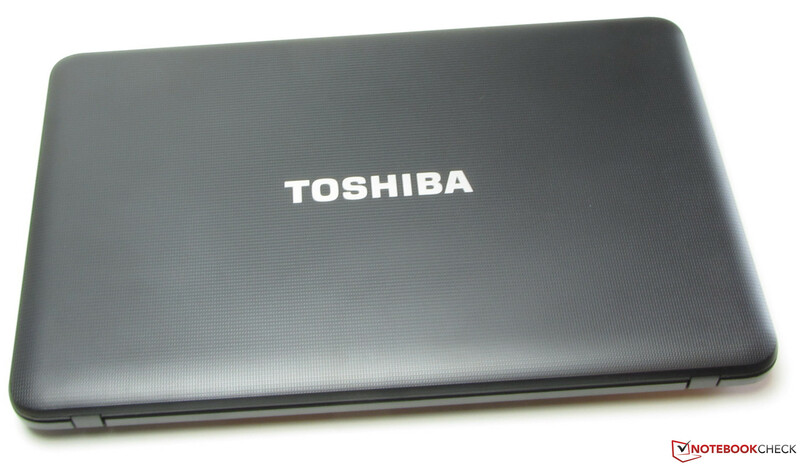 Toshiba selected a black plastic case for their Satellite C850. 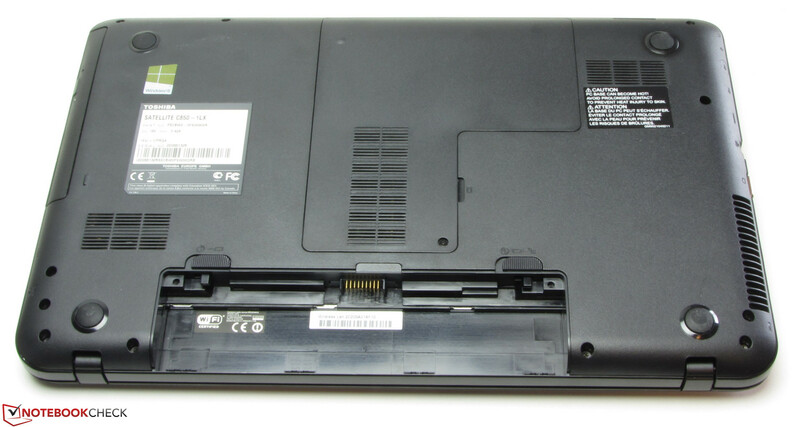 The aesthetic and design are familiar from the Satellite Pro C870 (17.3-inch notebook). 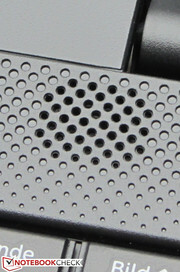 The manufacturer implemented exclusively matte surfaces, with one exception: The touchpad is encircled by a glossy ring. The palm rest, backside of the lid, and touchpad (including the keys) are clothed with a textured surface that adds traction and hides fingerprints. Both the Samsung computer and the F55A are dressed in purely plastic cases as well. Overall, the base unit only yields slightly under pressure. The left front edge is a weak spot. In this area, the case can be easily forced inward. This is not particularly surprising, given that the DVD burner is located underneath that portion of the case. The computer's torsion resistance could be stronger; the base unit twists too noticeably and easily. The notebook's lid can be bent with little force too. 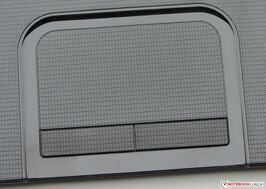 In many areas of the backside of the lid, the plastic can be forced inward far enough to cause alterations on the screen. The hinges hold the lid tightly in position and bounce a little. It is not possible to open the lid with only one hand. There is a maintenance hatch. The surface texture increases traction. All three of the notebooks we are comparing are equipped with today's customary connections. All the computers possess at least one USB 3.0 port. The two competitors have an advantage over the Satellite machine: Both devices offer a Gigabit Ethernet connection. The Satellite can only provide a Fast Ethernet connection. The C850's connections are not positioned in the most optimal locations. Most connections are located in the front section of the right side. 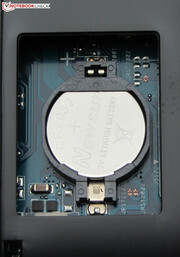 A memory card reader is located on the front side (SD, SDHC, SDXC, MMC). A WLAN module from Realtek (RTL8188CE) is at work in the C850. This module supports the WLAN standards 802.11b/g/n. The WLAN reception presented no problems. Neither in direct proximity (about three meters/~10 feet) nor two floors beneath the position of the router (transmitting power: 50 percent) did the connection break. The Ethernet chip is also from Realtek. Unfortunately, Toshiba installed only a Fast Ethernet chip -- in the year 2013 a Gigabit Ethernet chip should be standard. A Bluetooth module is not available, though Bluetooth can be used via a Bluetooth USB stick. The webcam (1 megapixel) produces a completely satisfactory image up to a resolution of 1280x800 pixels. The accessory assortment is sparse. A quick-start pamphlet and a user handbook are included in the packaging. 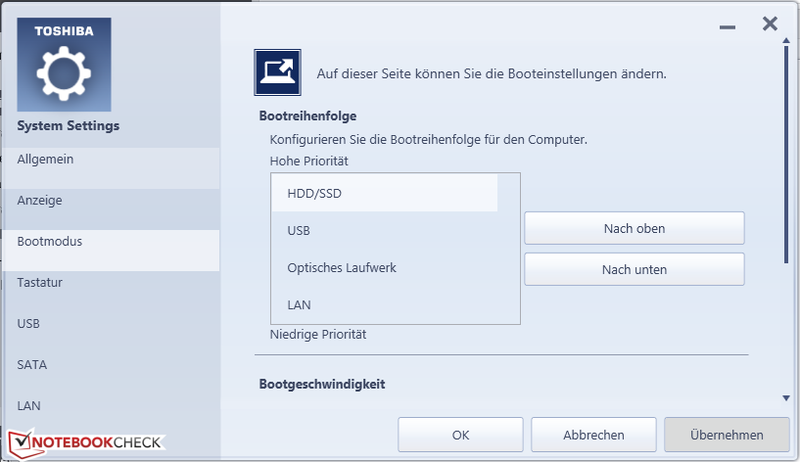 Windows 8 (64-bit) is installed on the Satellite C850's hard drive. A Windows 8 DVD is not included. To freshly install the operating system after switching out the hard drive (for instance in favor of a quick SSD), the user will need to run recovery DVDs. 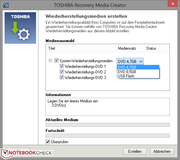 To that end, Toshiba included the Recovery Media Creator tool. For those who do not particularly like Windows 8 and would rather install Windows 7, the necessary Windows 7 drivers are available on the Toshiba website. To repair the operating system in case of a defect, the Windows 8 recovery system is at the user's disposal. The system can be accessed by continuously pressing the F9 key as the computer is booting. After removing the maintenance hatch, the user has access to the hard drive, working memory and the BIOS battery. There is no access point to the fan. 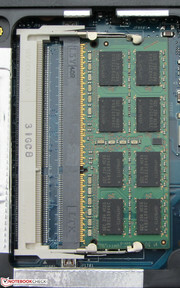 The Satellite C850 is outfitted with two working memory banks; one bank is occupied by a four-gigabyte module. According to the Toshiba website, the device supports up to 16 GB of working memory. The hard drive can be switched out easily; the drive can be simply pulled out. 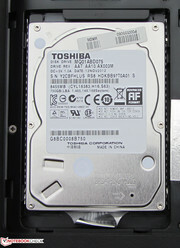 The Satellite is equipped with a 9.5 mm notebook hard drive. 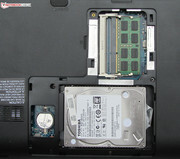 Any hard drive in which the connector is integrated into the caddy will fit in the notebook. Thin hard drives (7 mm) are of course also a viable option. The Satellite C870 is furnished with a 12-month Bring-In-Warranty. 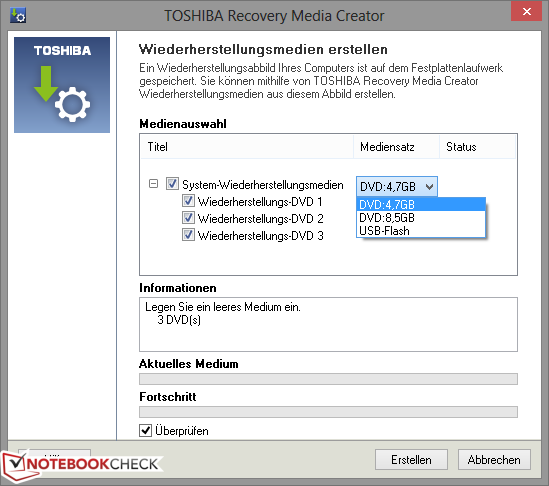 In the event of a warranty claim, the notebook's owner must send the device to Toshiba. By registering with Toshiba, the warranty can be extended to 24 months free of charge -- including pick-up service. Buyers of the Samsung computer also obtain a two-year warranty. Owners of an F55A have to be satisfied with a 12-month warranty. 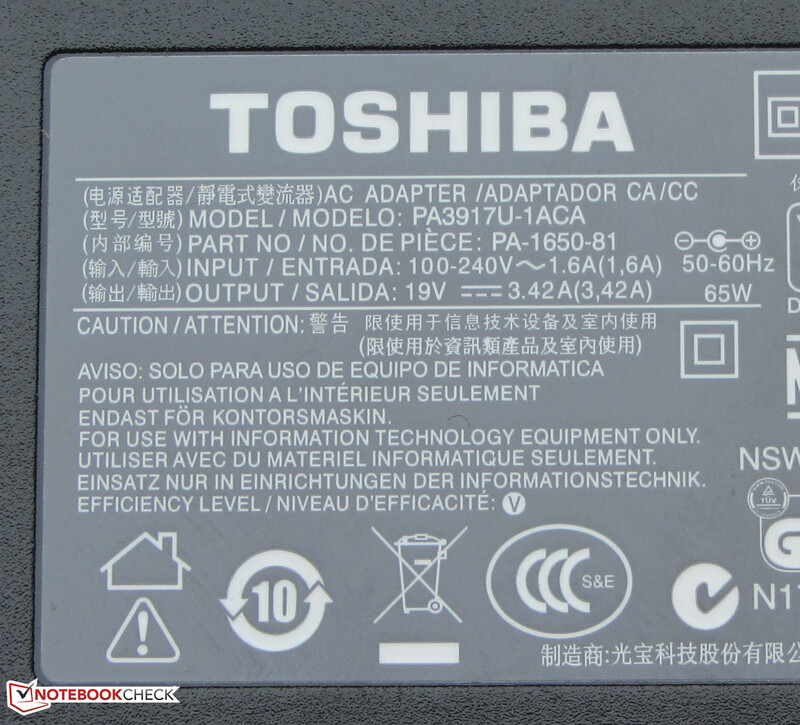 Toshiba offers further warranty options at additional cost: A three-year on-site warranty can be obtained for about 100 Euros (~$131), and a four-year warranty is available for about 150 (~$196). 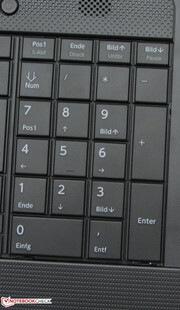 Toshiba equipped the Satellite with a conventional keyboard. It does include a number block. The main keys have smooth, flat surfaces and measure 17 x 15 mm. Overall; the keys have a mid-length travel and a good tactile response. We would have liked the resistance of the keys to be a little stronger. Unfortunately, the keyboard yields with each keystroke and therefore does not provide a very good typing experience. Both the arrow and the enter keys could have been a little larger. 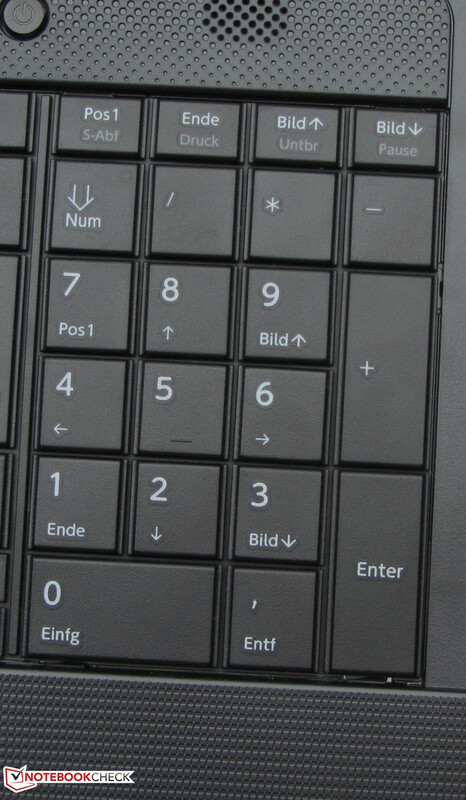 The C850's multi-touch-capable touchpad was conceived by Synaptics and measures about 8.6 x 4.6 cm (~3.4 x 1.8 inches). 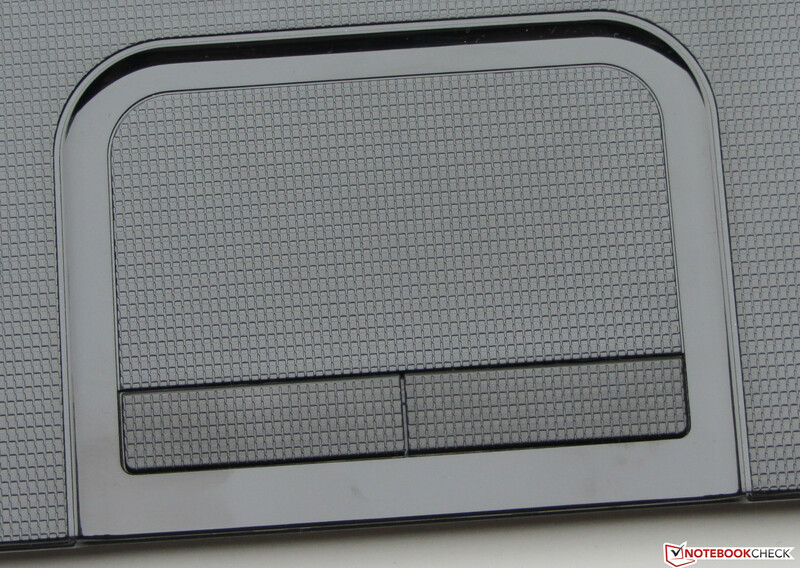 The pad is encircled by a glossy plastic ring that separates the touchpad from the palm rest. Both the pad as well as the mouse keys are spread with the same surface texture as the palm rest and the backside of the lid. The texture does not interfere with the glide of fingers. The various multi-touch gestures can be turned on and off individually in the touchpad's configuration menu. The two mouse keys have a short travel and a good tactile response. The keyboard yields to pressure while typing. Toshiba built the Satellite with a glossy 15.6-inch display with a native resolution of 1366x768 pixels. Other display types are not offered for the device. Those interested in a matte display might like to take a look at a model from the structurally identical Satellite Pro C850 series. We measured the display's average brightness at 184.4 cd/m², which is on the lower side of average for its price class. The displays of the F55A (239.8 cd/m²) and the Samsung computer (226 cd/m²) both reached substantially superior brightness values. The big surprises were the display's contrast (1094:1) and black value (0.18 cd/m²). Both values are very good. It is hard to come across results of this caliber even in considerably more expensive notebooks. Neither the Samsung computer's display (400:1, 0.59 cd/m²) nor the F55A's (241:1, 1.08 cd/m²) even came close to these exceptional values. 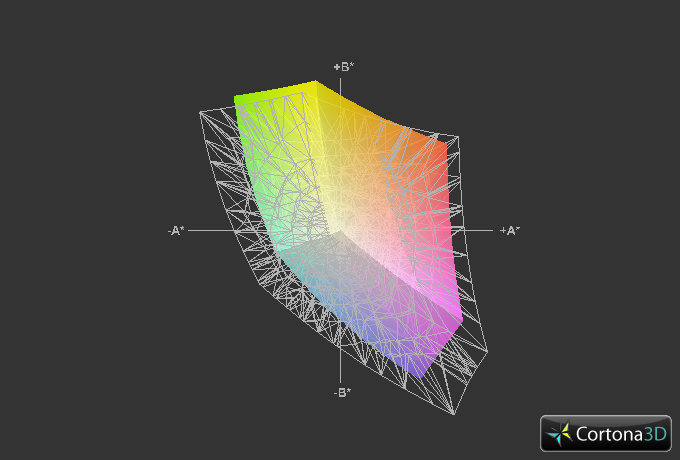 The Satellite's display can reproduce neither the AdobeRGB nor the sRGB color gamut. We measured the display in its factory settings (target color space sRGB) and detected substantial DeltaE 2000 deviations from cyan. 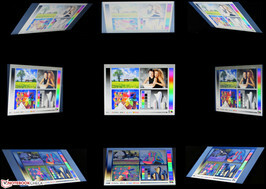 The display's DeltaE deviations from red, blue, yellow, magenta and the grayscale were smaller (between 5 and 10). Only green and white fell in the target color space (DeltaE deviations less than 5). The display's overemphasis of blues yields a cool impression. The display's high contrast value ought to enhance its readability in outdoor areas. Unfortunately, the low maximum brightness cancels out that advantage. Our pictures reveal that the screen content is barely readable. The photo below was taken on a cloudy day. In full sunshine the image would be almost completely obscured. The display's mediocre viewing angle stability once again betrays the notebook's price class: Changing the vertical viewing angle quickly leads to inversions of the image. The screen is more generous as the angles change in the horizontal direction. 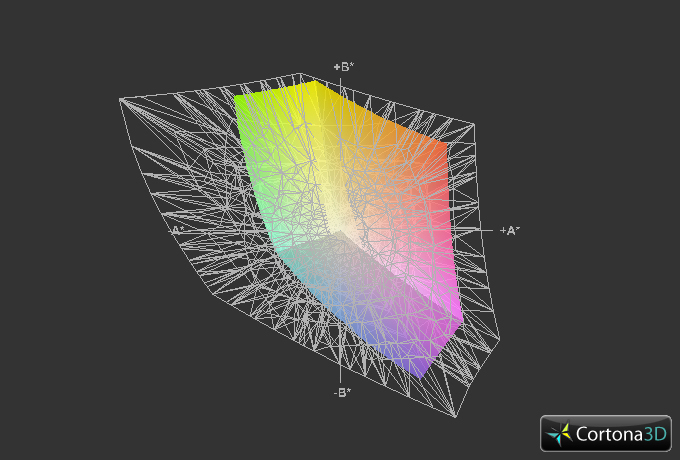 The display can be read from the side (up to nearly 180 degrees), though the image darkens progressively. 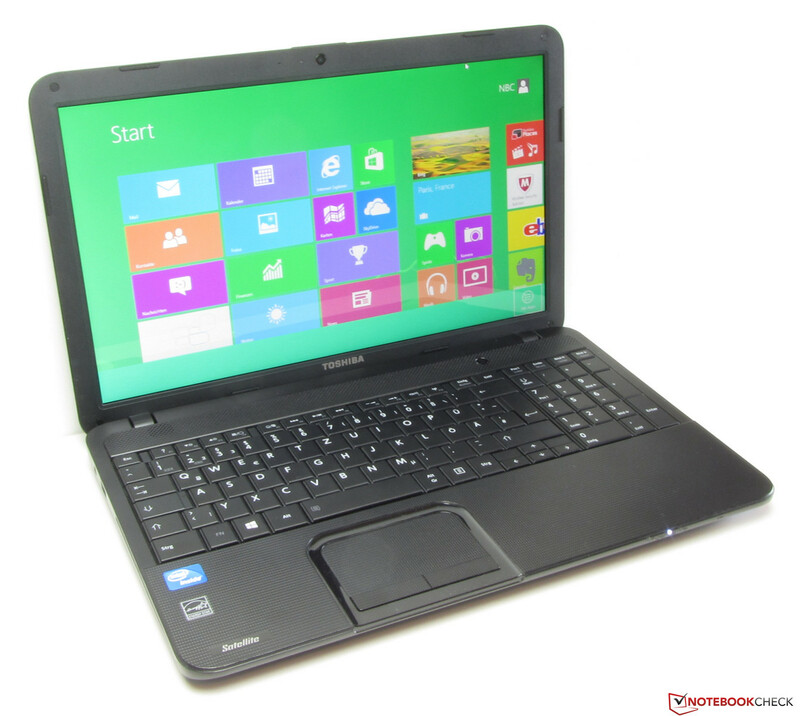 The Satellite C850 series consists of inexpensive 15.6-inch notebooks. All the models offer enough performance for everyday applications like word processing, Internet communication, video playback, etc. Our review device is currently available for between 400 and 450 Euros (~$523 and $588). 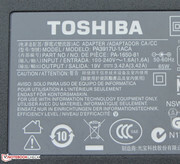 The Toshiba website presently lists a total of 15 models in the Satellite C850 series. The devices differentiate in terms of their processor (from Celeron to Core i3), hard drive size, amount of working memory, and operating system (Windows 8 or Windows 7). The most inexpensive model on the market at the moment (C850-11V) is available for about 350 Euros (~$457). The device is a Windows 7 Home Premium system, equipped with a Celeron B815 and a 320 GB hard drive. Under the label Satellite C850 Pro, Toshiba is selling a structurally identical series of notebooks for private and corporate use. The main difference between the two series (apart from the usual difference in components) is that the devices in the Satellite C850 Pro series are equipped with a matte display. In our review model, an Intel Celeron 1000M dual-core processor provides its services. This processor is from the Ivy Bridge generation. 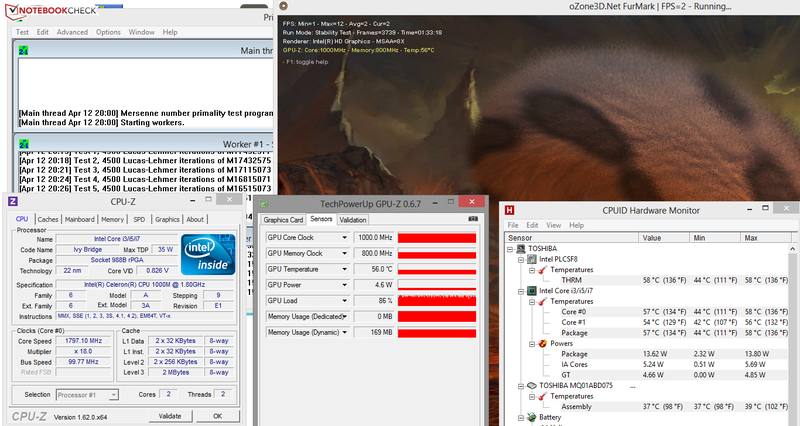 The CPU works at a speed of 1.8 GHz. The Celeron has no turbo mode. The processor completed the Cinebench benchmark's CPU tests continuously at full speed (1.8 GHz). The Samsung computer's AMD processor (AMD E2-1800, Radeon HD 7470M) is only 100 MHz slower, but it did considerably worse. The F55A's Pentium processor (Pentium B980, HD Graphics) was the clear winner. The Pentium worked at a markedly higher speed (2.4 GHz) than the Celeron and thus completed the tests strides ahead. If they were to have the same clock frequency, the Celeron would certainly come out on top, since the superiority of the Ivy Bridge architecture over the Sandy Bridge architecture would be evident. The Samsung computer possesses the strongest GPU and achieved the best results in the Cinebench R11.5 GL test. Surprisingly, in the Cinebench 10 tests the Samsung's GPU came in behind both of the competitors. Here the Samsung computer's weak CPU revealed its true nature. Although the Satellite and F55A's Intel graphics cores both bear the HD Graphics title, performance-wise they were not consistent. Here again the reason lies in the differing architectures (Ivy Bridge vs. Sandy Bridge). In every GL test the Satellite outdid the F55A. The system runs steadily and fluidly. The device's good result in the PC Mark 7 benchmark confirms the accuracy of this impression. The system is on par with that of the Dell Vostro 2520 (Core i3-2328M, HD Graphics 3000), which is outfitted with a faster and stronger Core i3 processor. The F55A's (Pentium B980, HD Graphics) PC Mark 7 results and those of the Samsung computer (AMD E2-1800, Radeon HD 7470M) were considerably poorer. In both cases the competitors' slow hard drives are to blame. The weak processor is an added handicap for the Samsung computer. Since there is only one main memory module in the Satellite, the main memory works in single channel mode. The CPU and GPU generally profit from a second main memory module, since they are more efficient in dual-channel mode. But on the whole, the Satellite does not profit from a second module. We installed a second module and ran the PC Mark 7 and PC Mark Vantage tests again -- in both cases the results were identical to those recorded in single channel mode. We expected a 10 percent improvement. However, installing a used SSD (Corsair Nova V32 - 32 GB) elevated the PC Mark 7 values considerably -- by about 22 percent, to 2555 points. 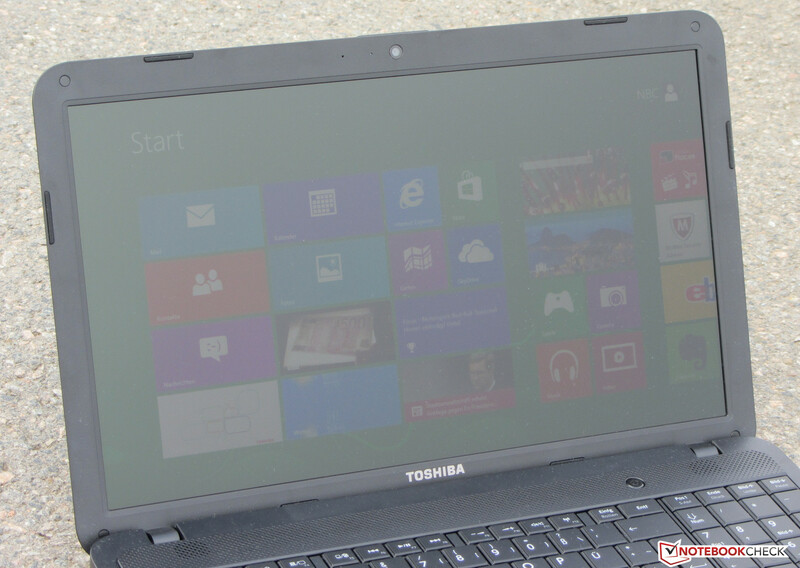 Toshiba furnished their Satellite notebook with a hard drive from their own company. 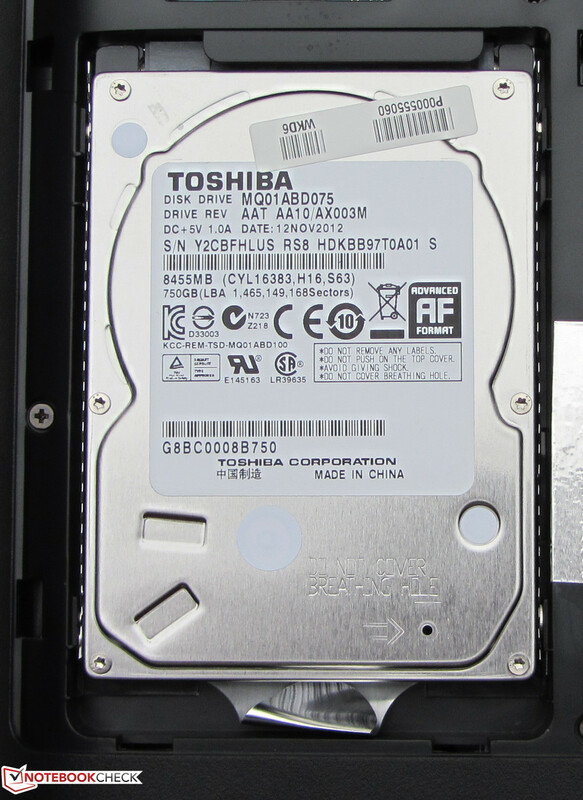 The drive has a capacity of 750 GB and works at 5400 rpm. At that number, there is ample space for music files, videos and pictures. CrystalDiskMark recorded a read speed of 98.1 MB/s. HD Tune reported an average transfer rate of 79.7 MB/s. These values are completely respectable for a 5400-rpm hard drive. The short access time of 16.7 ms is a highlight for the notebook. The Toshiba computer's GPU is also from Intel and bears the HD Graphics title (Ivy Bridge). It works at a speed of 350 to 1000 MHz and supports DirectX 11. The GPU's performance is stronger than that of the graphics core of the same name based on Sandy Bridge architecture. The GPU takes its position between the HD Graphics 2000 and the HD Graphics 3000. There is no surprise in the results from the various 3D Mark benchmarks: They simply correspond to the performance abilities of each GPU. The Samsung computer (AMD E2-1800, Radeon HD 7470M) achieved the best results, the F55A (Pentium B980, HD Graphics) the worst. The Satellite placed between the two. 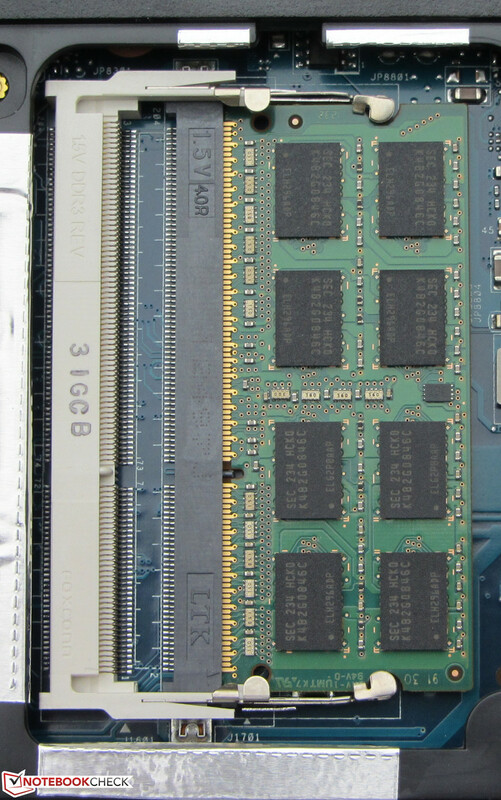 The 3D Mark 11 benchmark results were not improved by installing a second working memory module (dual-channel mode). The same went for the 3D Mark Vantage benchmark, though in the 3D Mark versions 03, 05 and 06 the results increased by about 10 percent with the installation of a second working memory module. The Satellite's CPU-GPU combination runs some current 3D games fluidly at low resolution and low quality settings. A less demanding game, like FIFA 13, can be played at the display's native resolution (1366x768 pixels) at medium quality settings. The frame rates can be partly increased with the use of a second working memory module. With two modules, the working memory runs in dual-channel mode, which benefits the GPU. As previously stated, the results from the various 3D Mark benchmarks were only partly improved with the installation of a second working memory module. The same was true in the gaming benchmarks. The frame rates in the F1 2012 game did not improve, but in Starcraft 2: Heart of the Swarm the frame rates increased by 10 percent. In Tomb Raider the frame rates went up by about 5 percent. Those who wish to play games often should contemplate purchasing a different notebook. The Aspire E1-571G (Core i3-3110M, GeForce GT 620M) and the Packard Bell EasyNote TS11SB-250GE (AMD A8-3520M, Radeon HD 6620G + Radeon HD 7670M) are two inexpensive 15.6-inch notebooks with good gaming performance. Both computers run most current games fluidly. In idle mode, we measured a sound pressure level of 32 to 32.2 dB(A). The fan does stand still occasionally, but even then, the computer is not silent -- the hard drive still whirs audibly. If the fan is running alongside the hard drive, the resulting noise is quite bothersome in quiet surroundings. The Samsung computer (31.2 to 34.8 dB(A)) was even louder than the Satellite. The F55A (30.6 dB(A)) ran the most quietly. At 34 dB(A) under medium load (3D Mark 06 running) and 37.7 dB(A) under full load (stress test, Prime95 and FurMark running), the Satellite was not overly loud and was on par with the Samsung notebook (35.4 and 37.5 dB(A)). The F55A (40.1 and 42.2 dB(A)) was considerably louder. The Satellite C850 in the Stresstest. The Satellite does not have problems with overheating, and it is cool enough to set on a lap in every load range. In idle mode, we measured temperatures between 25.4 and 33.9 degrees Celsius (77.7 and 93 degrees Fahrenheit). Under full load, the temperatures even fell to 22 to 32 °C (71.6 to 89.6 °F). It is not uncommon that a notebook's case warms up more in idle mode. The fan generally runs more slowly than under full load (or not at all) and therefore blows less warm air out of the case. The F55A and the Samsung computer both warmed up more than the Satellite under full load, but both of their temperatures were still in the green zone. The CPU and GPU completed the stress test (Prime95 and FurMark both running at least an hour) both in AC power mode and battery mode at full speed (1.8 GHz and 1000 MHz, respectively). The CPU temperature leveled off at about 57 degrees Celsius (134.6 °F) in AC power mode. (+) The average temperature for the upper side under maximal load is 26.2 °C / 79 F, compared to the average of 29.4 °C / 85 F for the devices in the class Office. 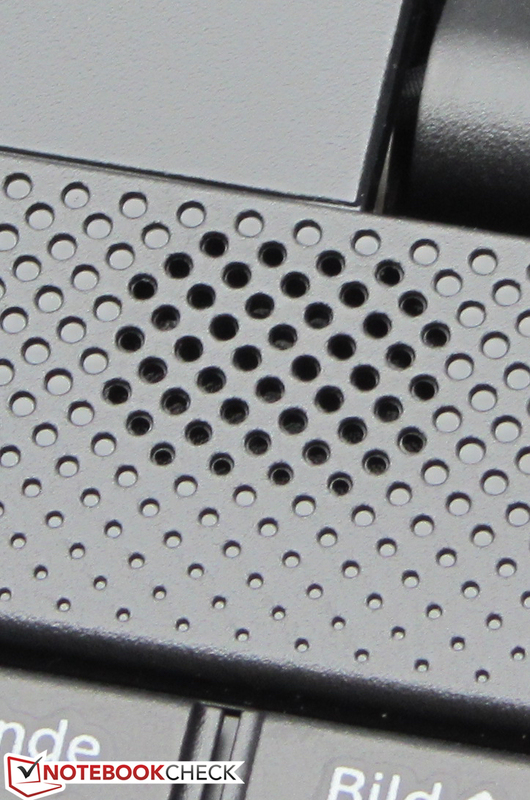 The Satellite's stereo speakers are located above the keyboard, underneath a plastic covering punched with tiny holes. The speakers produce a very thin, metallic sound. Bass tones are completely absent. The sound experience is considerably better with headphones or external speakers. In idle mode, we measured a power draw of between 8.5 and 12.1 Watts. With those measurements the Satellite proved to be markedly more frugal than the F55A (up to 16.2 Watts) and the Samsung computer (9.7 to 15.3 Watts). Under medium load (3D Mark 2006 running) and under full load (Prime95 and FurMark running) the Satellite contented itself with 27.1 and 30.5 Watts, respectively. Here the distance between the Satellite's results and the Samsung (35.2 and 43.9 Watts) and F55A's results (40.6 and 47.6 Watts) proved to be even greater. In idle mode the Satellite ran for 6:24 h and thus achieved a better result than the F55A (6:15 h) and the Samsung computer (6:07 h). We measure the battery run time in idle mode with the help of the Battery Eater Reader's test. The screen runs at the lowest brightness setting, the energy-saving profile is activated and the wireless modules are turned off. Under load, the Satellite ran out of steam after 1:44 h. The Samsung computer reached a considerably longer run time (2:47 h). The F55A (1:11) came in behind both competitors. We measure the device's run time under load with the Battery Eater Classic test. The screen runs at full brightness, and both the high performance profile and wireless modules are activated. In the more practically relevant WLAN test, the Satellite ran 3:47 h. The 355E5C (3:51 h) and the F55A (4:12 h) both lasted a little longer. In this test, websites are automatically loaded at 40-second intervals. The energy-saving mode is active and the display brightness is set to about 150 cd/m². After recharging the battery, the machine played a DVD for 2:49 h. Once again the competition (Samsung: 3:24 h, Asus: 3:47 h) lasted a little longer. The DVD test is run with the energy-saving profile active (or a high profile, if the DVD does not play fluidly), at full screen brightness and with the wireless modules deactivated. 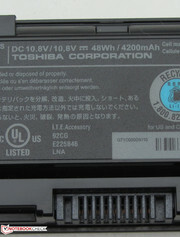 The battery run times of the three devices are easy to compare, since their batteries all have similar capacities (Samsung, Toshiba: 48 Wh, Asus: 47 Wh). 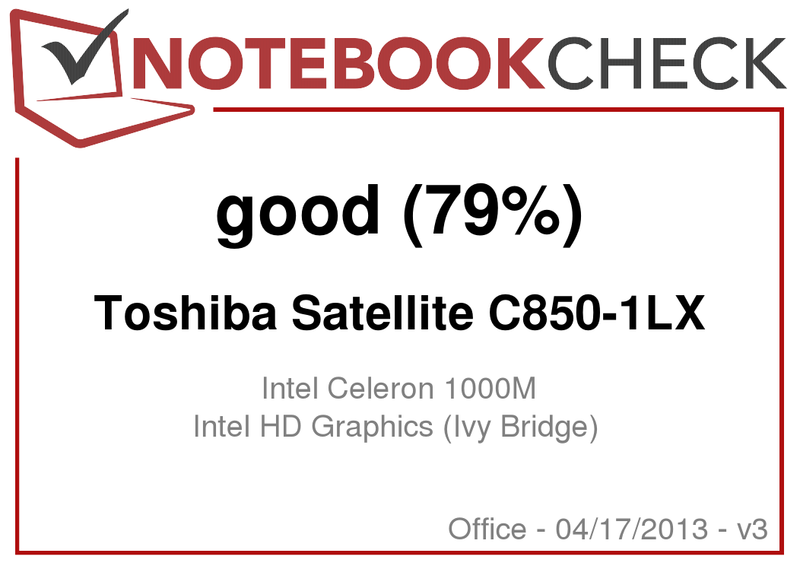 The Toshiba Satellite C850-1LX gains points for its good application performance, very high contrast display and its 24-month warranty. In addition, the case always remains cool and the computer's energy consumption is moderate. Thanks to the large hard drive, there is plenty of storage space. However, the notebook has its problems too. The display brightness is low and the keyboard sags while typing. The buyer also has to make do without Gigabit Ethernet. The hard drive also makes a lot of noise, and in combination with the fan, the sound is rather bothersome in quiet surroundings. The case could be more stable as well. The Asus F55A offers more computing power and a longer battery life. Those who are able to make do without more computing power can currently purchase the F55A's entry-level variant (Celeron B830, Ubuntu Linux) for about 260 Euros (~$340). The Samsung Series 3 355E5C-S02DE should be the first choice for anyone who needs a matte display and/or a good keyboard. 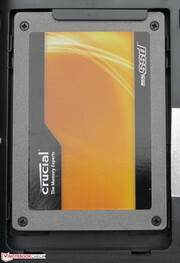 9.5 mm hard drives in which the connector is integrated into the caddy also fit (here an SSD). The hard drive can be switched out easily. There are two working memory banks. There is a number block. ...and provides up to 65 watts of power. 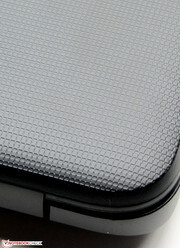 The texture on the backside of the lid adds traction. 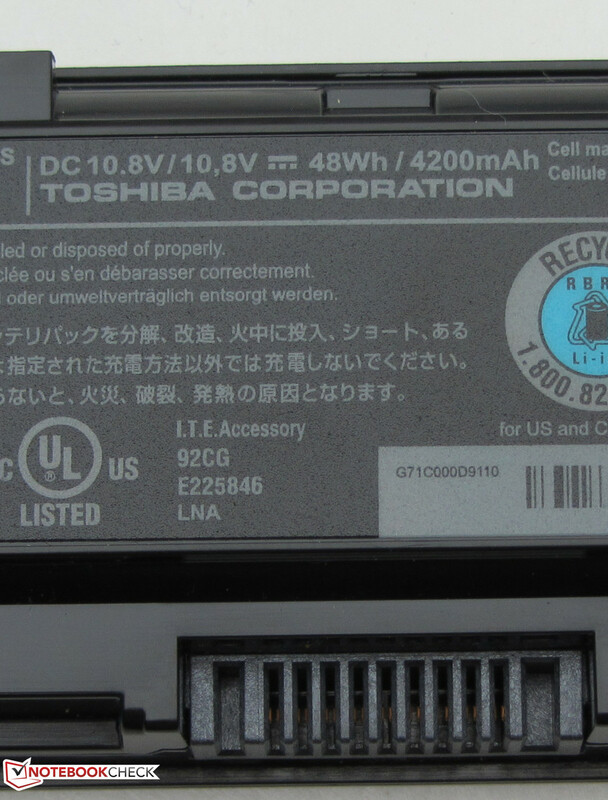 Toshiba offers a warranty upgrade free of charge. With the help of the System Settings tool various BIOS settings can be changed. These are effective following the next start-up. Instead of a recovery DVD, a USB recovery drive can also be created. The Satellite in outdoor use (on a cloudy day). The hinges hold the lid tightly in position. The DVD burner reads and writes every kind of DVD and CD. The two-year warranty and the high contrast display. Gigabit Ethernet and a brighter display. 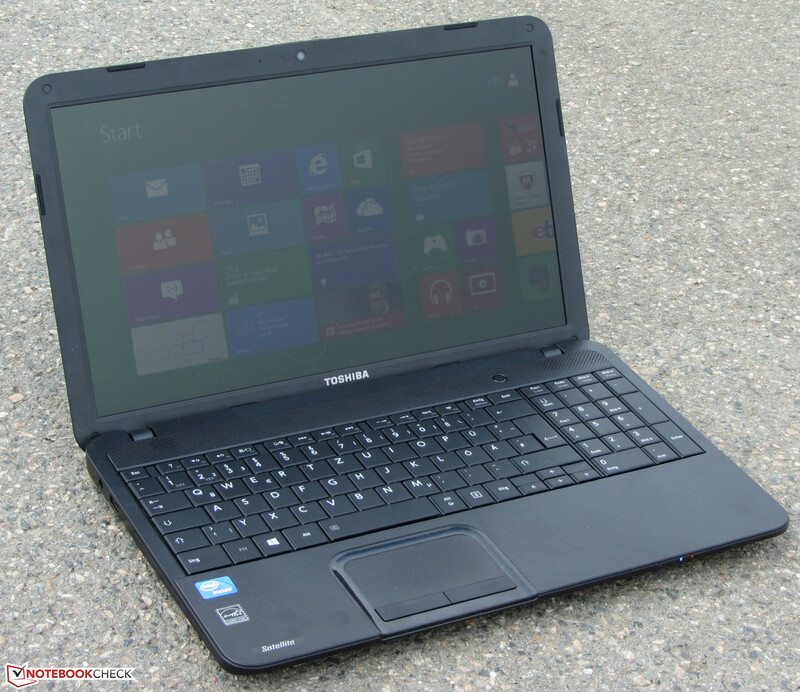 Toshiba furnished a low-priced notebook with a very high contrast display.